Officials scoring million-dollar kickbacks. Politicians flaunting obscene wealth. Cops so crooked they can lick their own shoulder blades. The people of Thailand are confronted daily with so many examples of corruption that they might understandably greet this news with skepticism or sniggers: from Nov. 10 to 13, Bangkok will host the world's biggest anticorruption meeting. What next? An antinukes conference in Pyongyang? Hold the sniggers. The 14th International Anti-Corruption Conference (IACC) expects delegates from more than 130 countries. 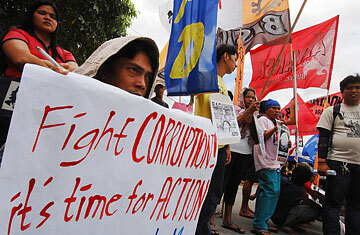 That fact alone suggests that corruption is not just a Thai issue or even just a problem for the developing world. It is a global scourge that threatens livelihoods, undermines development and dashes hopes for greater social justice. The IACC's theme this year is "Restoring Trust." It might more realistically be called "Battling Apathy," since alongside rising public disgust with corruption is an eroding public confidence in the ability of governments to combat it. Just look at Thailand's neighbors. Filipinos are already criticizing their recently elected President Benigno Aquino III for failing to live up to his reformist campaign slogan, "Without corruption, there's no poverty." In September, Cambodia launched a plan to fight corruption  but only after years of pressure from the foreign donors who still prop up its venal political and business elite. In Vietnam, many people believe that the recent lavish celebration of Hanoi's 1,000th birthday was designed largely to funnel money into officials' pockets. They may be right. The region's economic giants have the same concerns. Corruption and inflation "will have an adverse impact on stability of power" in China, warned Premier Wen Jiabao on CNN recently. Pratyush Sinha, who in September retired from his "thankless job" as head of India's corruption watchdog, told Agence France-Presse that about a third of his compatriots were "utterly corrupt." Sinha noted that such people would have faced a social stigma in the past. "That is gone," he said. This acceptance is alarming, since it creates an environment in which dishonesty can thrive even further. So does the fact that the institutions whose job is to fight corruption are very often corrupt themselves. Last year, a 69-country survey by Transparency International (TI), the Berlin-based group behind the IACC, revealed what most of us who live in the developing world already know: the most common source of bribe demands is the police. One out of four respondents who had contact with the police in the previous year paid a bribe. The same survey found that the people enduring most of these demands are those least able to afford them. Poor families in Mexico, for example, spend almost a fifth of their income on petty bribes. Bribery is on the rise in countries on every continent, further burdening families already struggling to cope with a global recession. But extortion is not limited to law enforcement. Corruption is like the common cold: all pervasive, continuously mutating, probably incurable. It now infects even areas of public life that we once (rather naively) assumed to be immune, such as sport and nonprofit work. Total eradication is impossible, but that doesn't mean fighting back is futile. After a survey in Bangladesh showed that 44% of patients in public-health facilities paid bribes, hundreds of youth volunteers were dispatched to give free advice. Afterward, the number of bribes went down, and the number of available doctors went up. Another unlikely source of inspiration is Indonesia. It ranks 111th out of 180 countries on the Corruption Perceptions Index, TI's annual attempt to measure the perceived levels of public-sector corruption. Yet faith in the country's Corruption Eradication Commission (KPK) has been so high that people have taken to the streets to protest threats to its independence. President Susilo Bambang Yudhoyono's perceived failure to protect the KPK from powerful enemies has eroded his credibility as an anticorruption President. Catching them young also pays dividends. In Thailand  where parents routinely get their offspring into better schools by bribing teachers with so-called tea money  a pilot program is instructing children fresh out of kindergarten how to recognize and denounce corruption. While the scheme is tinged with desperation  let's target kids because grownups are a lost cause  similar projects have been successfully tried with older children from Macau to Moldova. Another big issue at the Bangkok conference will be climate change  specifically, the billions of dollars the industrialized world has pledged to help developing countries mitigate and adapt to the adverse impacts of our warming planet. How do we ensure that this money reaches the truly vulnerable in graft-ridden countries like Bangladesh? TI calls climate change "perhaps the most complex global governance challenge the world has ever faced." In Bangkok, the IACC faces a more immediate challenge. Its opening speaker, Thai Prime Minister Abhisit Vejjajiva, could lose his job if a court finds his Democrat Party guilty in an $8 million donation scandal. There will doubtless be more sniggers if that happens, although it will certainly drive home the message of activists worldwide: corruption is everyone's problem  and apathy is no longer an option.